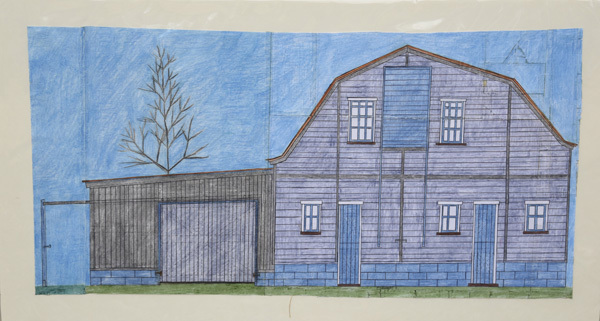 Jim Work, born 1944, likes to draw the vernacular architecture of the midwest: water towers, two story brick buildings, barns, and wind mills. He then colors them in with crayon and uses popsicle sticks as his straight edge. Once he has colored his buildings he rubs the surface with the side of his popsicle stick to smooth it out. The effect of this technique transforms ordinary crayon into a lustrous surface. Jim is developmentally disabled and autistic. Most of his buildings come from his imagination, yet reflect the common structures of small towns in the midwest. A one-person show of Jim Work's largescale highway drawings were exhibited at Intuit in the summer of 2001.